Benjipopo, or Benji, as she was often referred to as, was a red Poogle who lived with her two brothers, Karmash and bgav, and her sister, Dephna. Benji lived a very comfortable lifestyle in her luxury bedroom suite, high above, in the clouds of Faerieland. She played with Zuzzy, her petpet mazzew, and often invited the other petpets of the house to join in on their games. The little red Poogle was very outspoken and always strode confidently through the world of Neopia. Weak and unintelligent as she was, she didn't let anything intimidate her in the slightest. There was nothing special about Benjipopo, but you wouldn't assume it by the way she held her chin up high. The day Karmash was painted baby, Benji's world dramatically changed. At first, she was excited for her brother's newfound cuteness and huge eyes. However, she quickly realized, he was getting all the attention around the house. Benji was often forgotten, left in the shadow of the spotlight that always shone on her brother. She didn't mind, though. At least, not at first. Eventually, Karmash's fifteen minutes of fame ended, though it was always obvious he was the favorite of the family. Relieved that everything was back to normal, Benjipopo was comfortable again and all seemed well. Then, all too soon, Dephna was painted Tyrannian. This did not end up being as impressive as Karmash's transformation, at least in the eyes of the neofamily. Still, Benjipopo was hurt. She was the second oldest in the family, second to Karmash, and Dephna was the youngest. Yet, Dephna was painted before her and she couldn't help but wonder why. She decided to speak with Nas, their caretaker, who was in charge of these transformations. "Nas? Y'all there?" Benji asked after knocking on the door of the home's study where Nas was frequently found. "Come in, Benji, dear," a soft voice replied from within in the room. Benjipopo slowly pushed the old wooden door to the study open. It creaked slightly, as if in pain. The room was dimly lit by candles, scattered throughout the room. Shelves lined the walls, from the floor to the ceiling, leaving not a single trace of an empty space. The room had acquired the thick scent of old books and candle wax over the years, and was always faintly warm. Benjipopo despised being in here. Nas was hunched over yet another ridiculously thick, leather bound book. She sat at a desk in the far corner of the room, her large eyes staring so intently at the text as if she were being sucked into it. Her glasses were sliding down her long nose, though she didn't seem to notice. "Shut the door behind you," Nas commanded without looking up from her book. The door shut with a groan of agony and exhaustion. Benji made her way through the maze of randomly discarded papers, books, and whatever else that was lying around, to the table where Nas sat. "Listen, Nas, I been meanin' to talk to ya'll 'bout somethin'," Benji said hesitantly. Nas had a short temper, and she was not about to overdo it again. When it was evident Nas was not going to say anything in reply, Benji spoke up. "Why d'you go on and paint Dephna b'fore paintin' me? I'm second in line, ain't I?" Nas looked up from her book. She remained silent for a while, a look of concentration on her face as she thought of what to say. "Benjipopo, you are right to be concerned as to why Dephna was painted so quickly and you were not. I understand that you may be worried that something is wrong. Don't." She pressed her lips together, "Truth be told, my dear, I have not yet decided how to transform you. You see, I've been playing with many, many ideas that have ranged from faerie Lutari to Halloween Grundo. Try as I might, I have not yet decided what shall become of you." After a long pause, Nas spoke in a whisper, "You just haven't... inspired me." With that, the little red Poogle burst from the study, her eyes already full of tears, and bound for her room. She slammed the door behind her, ignoring the questioning looks of her siblings as she passed by them. She fell on her bed and sobbed as she tried to process what she was just told. 'You just haven't.... inspired me,' Nas' voice haunted in her head. She wondered what she possibly could have done wrong that she would not be anything more than just a plain, red Poogle. Benji did not understand. Karmash and Dephna were already painted, which left Bgav and herself. Bgav, they all knew, was to be painted shadow. Bgav was exactly the same age as her, yet she wondered why she was the only one who did not have a purpose in the family. She could not stand the idea of just being there. She was neither intelligent, nor strong, nor rare. Now, she would not even be beautiful. Benjipopo, the red Poogle, wept until she could weep no more. She was worthless. Eventually, though, Zuzzy snuggled up close to her and succeeded in calming Benji down. Soon, they were both deep asleep. When she first awoke, Benji had forgotten all that was said in that dimly lit study. Unfortunately, all it took was a few seconds before she glanced at the makeup smudged all over her pillow to realize what she would've been happier to have forgotten. A place in her chest felt sore and hollow. Benji padded to the mirror slowly, to face the neopet she was. An endless stream of negative thoughts coursed through her head, blinding her from anything but self-hatred. She began to cry again. There was a soft knock at the door. "Benji? May I come in?" the familiar voice of the Peophin asked in a concerned tone. Benjipopo sniffed and opened the door for her sister. "Oh Ben, sweetie! What happened? What's wrong?!" Dephna gasped. Never before had she seen Benjipopo vulnerable. They hadn't known each other long. The Poogle just sniffed, trying to stop the waterfall flow of tears. "Aw, hun, don't cry," Dephna tried to be encouraging. "Do you wanna talk 'bout it?" Benji shook her head and turned away from her sister. Her lip trembled as she said, "I-I jus' dun-dunno wh-who I a-am. I ain't sm-smart, nor strong, n-nor even p-p-preettttyyyyy and I never w-will beeee!!!" She collapsed onto her bed in a heap of sobs. "I'm s-so worthless," she concluded. The room was quiet between Benjipopo's sobs. "You know," Dephna started, "I think getting a little fresh air would do just the trick!" "W-w-what do you mean?" Benji asked her sister. Dephna grinned sheepishly and said, "Pack your bags, Ben. You're going on an adventure!" Benji groaned, but the idea of exploring Neopia in search of where she belonged didn't sound like a bad idea. She began packing. Not too long after, Benjipopo, the little, red Poogle, set off on her journey. She didn't bother wandering the streets of Faerieland aimlessly. She loved it here, she knew, but she was always mocked for looking like a racer. She has screamed, "I'm not even yellow!!!" countless times, frustrated with all the Neopians who assumed she loved running. As if she would ever let herself get the slightest bit sweaty. Keeping that in mind, Benji wandered west to the Haunted Woods. It was astonishingly obvious where Faerieland ended and the Woods began. The sweet air, filled with the scents of dozens of flowers, turned sour and murky. The chirping birds became inaudible, and were replaced with the moans of monstrous trees. She remembered the door of the study. Was that haunted, also? She also remembered the conversation in that room, and sighed. Her disappointment did not slow her down, on the contrary, it motivated her to continue on her long, tedious trek. Each step she took, the spookier her surroundings became. By the time she finally got to the Brain Tree and the town, she was scared out of her wits, and convinced that shadows were stalking her. The first creature she met was the Esophagor. "II AMMM HUNGGRRYYY..... feeed mmeee annndd I wwilll reeewwaardd yoouu....," the Esophagor said creepily as she approached. Terrified, Benjipopo sprinted, in the opposite direction. She ran and ran. Never before had she encountered something so vile, so horrendous. The memory of the ghastly monster made her whimper. Finally, she was out of that horrible place. She sighed, thankful Nas had not decided to paint her Halloween, or anything else creepy, for that matter. She could've been as ugly as that thing. Speaking of disgusting, Benji realized she was sweating. She was very hot. 'I shouldn't have done all of that running,' Benji muttered to herself. The sun beat down on her strongly, and it was not long before she realized where she had ran off to. The sand that got stuck all over her fur irritated her. She was already hungry, thirsty, and in dire need of lip gloss. Not too far off into the distance, she could see that there was a city. As Benji approached Sakhmet, the buzzing of neopets grew louder and louder. When she got close enough to hear what they were saying, she realized how amazingly crowded the little marketplace was. She suddenly felt claustrophobic. "Lovely foods of the Lost Desert!!!" "Desert friends to make your Neopet smile!" "Rare and exotic battledome weapons from all over Sakhmet"
"The finest pottery and Earthenware in the land!" "The finest cures in the entire Lost Desert!" "The Wisdom of the Ancients is contained upon these scrolls!" The shouts of the shopkeepers made her head spin. 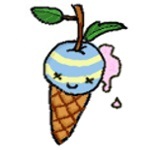 To make it worse, there were hoards of neopets all crowded around to sell their own little things, and also shoppers. She could barely took a step without being offered the 'finest' of something or another. When Benji finally did get through the hectic city of Sakhmet, she was completely covered in sand and the germs of the dozens of grimy neopets who had brushed against her. She sneered angrily. She had had enough of this. She was going home. The voice in the back of her head whispered, 'haven't inspired me'. Benjipopo straightened her back, once again regaining purpose. Her purpose, she knew, was to find purpose. She cut through the fields that linked Faerieland and the Lost Desert. She continued traveling north, past Brightvale and Meridell, past Kiko Lake, Neopia Central, past Roo Island. She traveled until she could no longer do so on foot anymore. She had reached the northern sea. Benjipopo was headed straight for Terror Mountain. She had never ventured there before, and the name of the place did not help her anxiety. The boat trip was only a couple hours, and soon, she arrived at the frozen mountain. When she reached the city, she couldn't possibly imagine why anyone would think of naming this merry place "Terror". Benji took her time touring the place. She admired the Merry Outfits, played Rink Runner, enjoyed a slushie from the Slushie Shop, and even scratched a scratchcard. She then ventured up to the top of the mountain. It was very cold. Her fur stood on its end the whole time she was there. She found solace in the Super Happy Icy Fun Snow Shop, the name seemed welcoming enough. A crazy Lenny shopkeeper greeted her, "If you are feeling cold, why not feel even colder with these icy treats!" and then tried forcing Chia pops down her throat. After reluctantly purchasing more Chia pops that she would ever need, Benji left. She had to get out of the snow, though. She tried to search for a place to hide as quickly as possible. She ran down until she came across some caves. Though they were made of ice, they were shelter from the snow and that was good enough for Benji. Upon entering the caves, she found herself astounded, mouth hanging open. Where she expected to find a hollow, empty cave, was a humongous ice city! Amazed, she forgot that the cave was made of ice and slipped. She fell right into another Poogle, who was blue and wore ear muffs and scarf. "OW! Watch it!" the blue Poogle said, pushing Benji off of her. "I'm sorry," Benji said. "I've never been here before. It's sure beautiful," she said, her voice still full of dazed wonder. "Huh.. never been here before, you said? Well I know the best place in this whole cave!" the blue Poogle replied. "Really?! Where?!" Benjipopo asked, more excited now than she had been in a long time. "Well," the blue Poogle said. "Just go down this path here, and it should take you right to it." "Wow! Thanks! And, again, I'm so sorry for running into you!" "No problem. Have fun," the blue Poogle said as it walked off. Benji thought she heard him snicker. Benjipopo started down the path the blue Poogle pointed out. She didn't walk long before she was tired and annoyed. She wanted to get there already! What she didn't expect was who (or what) would be waiting for her. The Snowager roared. Benji sat there, stunned. Never before had she seen so much wealth in her life. She had also never been so terrified in her life, either. She ran, screaming. Thankfully, the Snowager was too attached to his treasure to care to get up and attack her. Still, she didn't relax until she was back on the boat to Neopia. Benji realized she had been gone for days now, and she should probably be getting home soon. She was hungry, and everything she wanted was waiting back at Faerieland for her. 'Well... almost everything,' she thought. She sighed for what seemed to be the thousandth time that week. She still hadn't made much of any progress discovering who she was and what purpose she might have in the world. The boat docked back in northern Neopia. She headed into town for something to eat before she went home. She sat, staring at the Rainbow Pool, thinking. She was still zoned out when someone ran into her. "Umph!" the stranger said. "Oh! I'm so sorry! I'm just in a hurry, I have somewhere to be, you see." Benjipopo gave her a onceover. The faerie Krawk was beautiful, but her outfit just wasn't. "Oh... uh-uh! Honey! Oh goodness, we gotta take you to Uni's Beauty ASAP!!!!" Benji exclaimed. The Krawk gave her a confused look before she held out her hand and said, "My friends call me Chloe. Judging by your outfit, I'm going to trust you know what you're doing... but, can we make this quick, please?" "Please, girl, fashion is my game, or my name isn't Benjipopo. Let's go!" With that, they were off to the Neopian Bazaar! "We sell the finest clothes in Neopia!" the shopkeeper greeted them as they entered. They rushed past her and into the clearance aisle. "Uh.. I don't shop clearance. My clothes are all name-brand," Chloe said, skeptical of the strange Poogle's decision. "What's your name again?" "I'm Benji. And don't ya'll be questionin' what I know best," she replied. The Krawk rolled her eyes, but obliged. Benji ripped through the clothes of the clearance aisles tirelessly. After only ten minutes, she emerged from the huge piles of rejected clothes victoriously, outfit in hand. "Well, what do you think?" Benji called from outside the dressing room. Chloe emerged with a glorious outfit on. She wore an Extravagant Krawk Dress and held a Pink Knit Purse. In addition, Benji found an Illusen's Potted Orchid. "Yeah? Y'all like it? Best part is, it's all clearance, so won't burn no hole in your pocket!" Benji exclaimed proudly. "Thank you! Thank you so much! I look so much better! How could I ever repay you?" the Krawk asked. "No, there's no need. Please, it was my pleasure!" Benji replied. "But you must..." Chloe gasped, then smiled. "How would you like to be my firm's new fashion advisor? 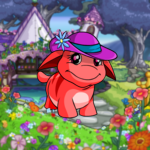 I run a modeling agency and we could really use your talent to help dress those neopets up!" Benjipopo stood there shocked. It wasn't long before she came out of her trance and started squealing, "Thank you! Thank you thank you thank you!!!!" She hugged Chloe too tightly for the Krawk's comfort. "You start tomorrow. Don't be late. Here's my card. The information is all there," the faerie Krawk said. She then turned around and left, late for her meeting. Benjipopo arrived home about an hour later, satisfied to have helped the beautiful Krawk and, in doing so, landing herself an amazing job. She sighed happily and smiled at the ground. "What're you so happy about? I'm guessing the journey went well?" Dephna smiled as she approached her sister. "More than alright! I gotta job! Thank you, Dephna," Benji said sheepishly. "That's great, Ben! My pleasure," the Peophin said as she walked away. Then, quickly added, "You better go talk to Nas about this!" Benjipopo knocked on the large, old, wooden door. "Enter," Nas' voice called from inside. Benji came in quietly and sat beside Nas, waiting for her to look up from her book. When she finally looked up, glaring with a face that screamed she was annoyed, Benji said, "I'm sorry I got upset with you. I have found my place in the world." Nas raised an eyebrow. "Oh, really now?" Benji nodded, excitedly. "I'm gonna be a fashion designer and then all my dreams will come true!" she said. Nas eyed her seriously. Finally, after what seemed like ages, Nas opened her mouth to speak. "Benji, my dear, save yourself the stress," she said. "Life is not about finding a purpose, it's about creating a purpose. You see, trivial things such as talent or skills are not important in life. Being incredibly intelligent, or extraordinarily beautiful do not enhance your being. It is the kindness of your heart and your actions that make you wonderful. Benjipopo, in order to find contentment, you cannot go out searching for it. The world cannot give you what you desire, you must seek it from within yourself. To be comfortable in your own skin is the most respectable trait one can have. Being yourself is the best thing you could possibly be. No amount of training or transformations could change that." She paused and looked at the ground, biting her lip. "Do you understand what I mean, sweetie?" Benjipopo was shocked. What did she mean your self-worth isn't increased in direct proportion with your number of neopoints and popularity? The Poogle sighed, trying to soak in the wisdom she had just been given. She didn't understand, but she nodded anyway, smiled, and left the study. A few hours later, Benji and Zuzzy were about to leave for their evening walk around Faerieland. Benjipopo opened the door when all of a sudden..
"Look! There she is! SMILE!" a yellow Skeith with a large camera exclaimed. The little red Poogle was immediately blinded by the number of flashing lights, photographers snapping photos of her. "What's your inspiration, Benjipopo?" a paparazzi asked. "How did you do it?!" another exclaimed. The buzzing of the strangers with cameras was overwhelming and Benji slammed the door shut. She sunk to the floor, grinning. It seemed she was finally getting what she wanted: a little fame and a little glamour. Still, she thought, what was so special about her? Why were these people at her door? Better yet, what were their questions all about, anyway? Then, she realized: Chloe. It seemed dressing well had its perks.